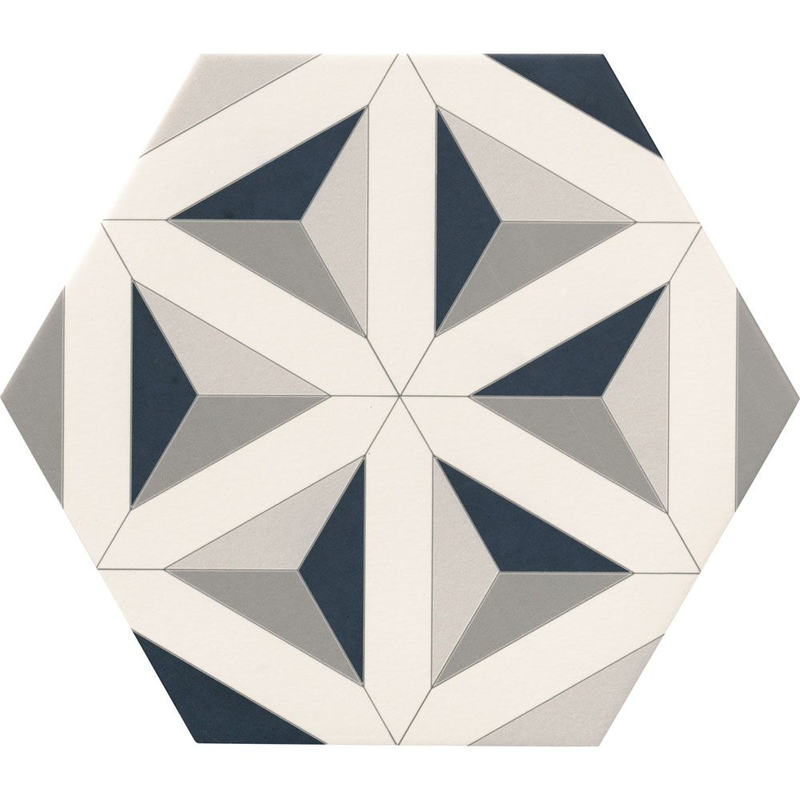 Create a statement floor in your living room, hallway, kitchen or bathroom with these striking Contour Shadow Hexagon Tiles. They consist of a 3D-effect star-shaped geometric design, in a mix of white, black and grey tones. Made from porcelain, they're very durable, and are suitable for floor areas throughout the home. They fit in with two major interior design trends - hexagonal and geometric. We recently donated these tiles to an episode of DIY SOS! Nick Knowles and the team used these hexagonal tiles to create a refreshing new look in the home of a family in need. In limited instances a very faint micro line may appear on the surface of the tile, this is a characteristic of digital printing technology, and will in no way compromise the final aesthetical appearance of the tile when laid. These tiles are beautiful. Really pleased with them. The darker triangles in the design are black and the remainder are shades of a light grey, all on a white background. The appearance can vary on screen to real life and would suggest the sample tile is viewed in your area to ensure suitability before making your final decision. what size grout line is best and which colour grout? presumably grey shade? After you have received the samples, if you call our sales team on 01536 314730 to place an order, they will happily refund the cost of the sample order at the same time. hi would these be suitable for a wet room ? These tiles are fine to use on a wet room wall. If you’d also like to use them on the floor, they're matt, so they do have some non-slip qualities, but some customers prefer the extra slip resistance offered by tiles with an anti-slip finish. Please advise are the contour hexagon shadow ok for bathroom floors and underfloor heating? These tiles are a glazed porcelain so they are compatible with underfloor heating and suitable for use in bathrooms. The matt surface gives a degree of slip resistance and we would recommend you order a sample first to make sure you are happy with the colour and finish.